In recent years, the gaming scene has become awash with warfare simulation games that focus on building a strong military base. If you are into such games, Army of Allies on PC is another great creation that is worth exploring. It will thrust you into a world that is rich with vast territory and resources but engulfed in chaotic wars. As the commander, you will embark on a quest to build a strong fortress. You can set up all kinds of facilities on the base to support your army. This will cost you stone, wood, food, iron, gold, and silver. However, you earn the same resources along with player EXP for every completed building quest. You will gradually upgrade your military base as well as recruit troops and specialized forces before marching to battle. A good strategy is critical if you want to dominate in this real-time multiplayer warfare game. As you develop your base, resources and space will run out soon. This leaves no choice but to invade and plunder enemy bases. The world map is full of wooded areas as well, but enemies lay claim to every space available. So, be it territory or supplies, fighting for what you needs to reign supreme is inevitable. Battles are completely automated and players don’t control anything. You simply need a tactical advantage in how you deploy troops and artillery when marching to war. After triumphing in battle, you can cut down trees and create slots for building or seize enemy supplies. 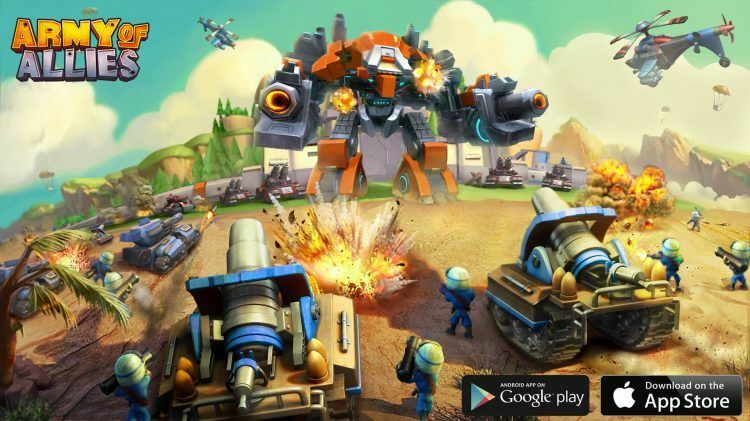 As this game’s title suggests, you will need to form allies in order to dominate in war. You earn up to 300 diamonds the first time you join a legion in Army of Allies on PC. What’s more, you will be able to buy useful commodes in the Legion Shop as well as receive the daily Legion Gift. More importantly, allies in a legion can exchange resources or send each other battle reinforcements at any time. So, be prepared to join forces with the most feared armies and work together to conquer the world. Constructing or upgrading any building takes time. This can take anywhere from a few minutes to over an hour. However, you can use the free acceleration prop to speed up the building process. Focus on upgrading the facilities that already exist if there are no open construction slots. In exchange, you will earn different advantages depending on the upgraded building. Production capacity increases if you upgrade the farm, quarry, gold mine, iron mine or logging camp. Upgrading the science research center and gear hub will speed up operations. Leveling up the arsenal and rescue center allows you to train as well as treat more troops. There are different rewards to claim in the game. This includes resources for finishing daily tasks, loot for completing quests, signing awards, and your 30-day supplies shipment. Make sure to claim these bonus rewards to increase your resources. From sergeants and lieutenants to gathering and marching troops, there are different specialized forces in the game. To unlock new troops, upgrade your arsenal. You can unlock new heroes as well by expanding your territory. Army of Allies on PC hosts single and legion-based contents every week. Visit the ‘game events’ section on a regular basis and take part in the contests to win special rewards. Go to the search box in Bluestacks and type “Army Of Allies” without the quotes, of course. That is it! You can now enjoy your freshly installed copy of “Army Of Allies” on your favorite PC!